A career in Advertising and Editorial Photography is a highly attractive prospect for photographers who enjoy travel, meeting creative people and solving visual challenges. Advertising photographs are used to help describe and sell a product or idea, and are usually accompanied by a short phrase or strap-line, while editorial photographs illustrate and enhance the impact of a story or report and are used widely in newspapers, magazines, newsletters, books and websites. The work in Advertising and Editorial Photography is varied, exciting and highly stimulating - it is also extremely competitive. That said, those who can demonstrate an ability to interpret ideas and stories through original and emotive photographic images enjoy strong career prospects. These areas of photography are often grouped together because advertising and editorial photographers are usually self-employed and are commissioned to work by Art Directors or Picture Editors from advertising agencies, magazines or design groups. This means that they are paid a fee for a job and do not get paid if they do not work. It also means that a lot of time is spent running a small business and touting for work, rather than taking photographs. The advertising industry is a large buyer of photographic images. Advertising Photography is photography destined for advertising purposes and can be of just about any subject but is often categorised into the following specialist areas: Still Life, Food, Cars, Portraiture and Landscape. An advertising photographer is likely to build a reputation for excellence in one of these areas and will often be commissioned on the strength of past campaigns. Some Advertising Photographers specialise in producing well-lit product shots for use on packaging, point-of-sale advertising and in catalogues. These so-called 'Pack' or 'Pack Shot' photographers are often salaried studio employees, working standard hours, five-days a week, with all the benefits that regular employment offers. Some photographers manage not to be type-cast and do a variety of work. Because the assignments are directly linked to the success of selling a product or services, the budgets tend to be a little larger then for other uses. Productions can be made bigger when there is money behind it. Editorial photography is work which is commissioned for articles in newspapers, magazines and websites, chapters in books and text in company brochures. Since these publications cover almost every area of interest, photographers with a background in many different disciplines may be involved in this field, working both in studios and on location. Photographers are usually briefed by the publication's editor or picture editor regarding the substance of the story, the image of the publication, the target readership and possible images that would attract attention to the article and help interpret the subject matter. It is then the photographer's job to shoot images that will answer the brief and satisfy or exceed editorial expectations. Editorial budgets tend to be much smaller than advertising ones so often new photographers start off by doing editorial work. Many photographers choose to do editorial shoots because they often allow a greater amount of artistic freedom. However, the subject matter may be exactly the same as for an advertising or fashion shoot. Editorial shoots also are used as exposure for the photographer; having one's photographs appear in a national magazine can lead to other clients seeing them and booking the photographer for other jobs. Photographers are paid per 'story', per page, or per image used. The profit margin on editorial work is very slim. Photography costs are understood to vary according to the area of specialisation. Room sets are expensive to shoot because the magazine has to pay using the studio to construct and strike the set as well as paying for collection an delivery of props and set building fees. As with food photography, roomset photographers are fewer in number and in great demand, so magazines are more or less obliged to pay a proper rate. Established advertising or fashion photographers may also do editorial work to supplement their big-budget commissions. Producing high quality photographs to a tight deadline and exacting client specifications can prove stressful. In order to succeed in the fields of Advertising and Editorial Photography, photographers should therefore be organised, practical and creative, with a calm, friendly attitude. They must be highly motivated and self-confident in order to promote themselves, and should continually update their presentation portfolio. They need to understand the principles of composition , and have an appreciation of shape, form, colour and tone . Many photographers in the Advertising and Editorial Photography fields start out by assisting an established photographer and learn on the job. This can provide invaluable experience, offering the opportunity to meet clients, art directors, models, etc., to hear their discussions with photographers, and to understand the details of the preparation, execution and presentation necessary to the job. 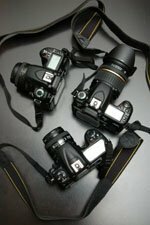 Editorial Photographers may also start out as a Press Photographer or Corporate Photographer who shows a particular aptitude for taking strong thematic photographs. No set academic qualifications are required to work as a photographer in Advertising and Editorial Photography fields, with career advancement based largely on portfolio, track record and reputation. There are many excellent college courses around the country which provide a sound technical grounding, as well as access to work placement schemes. The Professional Qualifying Examination (PQE) offered by the British Institute of Professional Photography (BIPP) has a good reputation with employers. Many practitioners start out by assisting an established photographer and learn on the job. Membership of the British Institute of Professional Photography (BIPP) , the Association of Photographers (AOP) and the Master Photographers Association (MPA) may also be beneficial.